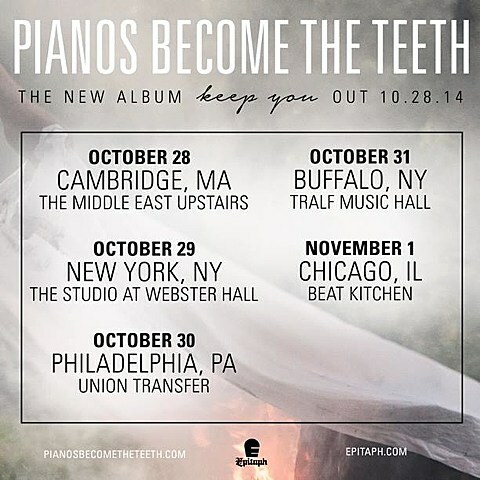 Pianos Become the Teeth recently announced that their new album Keep You will be out on October 28 via new label home Epitaph, and put out the excellent single “Repine,” which had them leaving their screamo roots for clean singing. They were already announced for the second leg of the Title Fight/Circa Survive tour, but not the NYC show happening 11/11 at Best Buy Theater. And now they’ve added a short record release tour with newer screamo band Frameworks and Gates that kicks off in Cambridge on release day and hits NYC on October 29 at The Studio at Webster Hall. Tickets for that show go on sale Wednesday (9/24) at 10 AM.